Go behind the scenes of one of the most involved Google doodles ever. 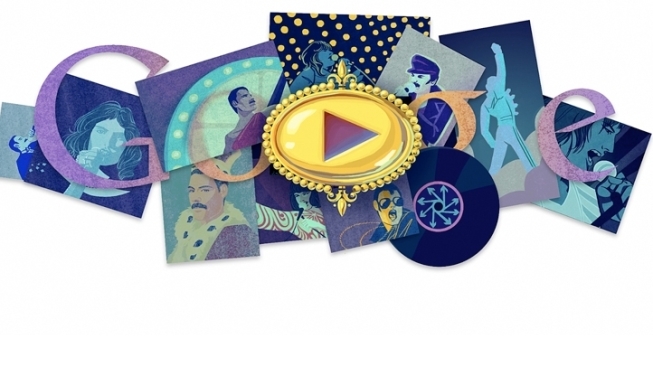 Google celebrated what would have been Freddie Mercury's 65th birthday on Monday with its second longest doodle to date. The 98-second-long animation shows the lead singer of the British rock band Queen navigating through a crazy world inspired by his own lyrics. In one scene that looks like an old-school video game, Mercury bounces off clouds, flies on a tiger and shoots at aliens from a spaceship, all to his hit song "Don't Stop Me Now." Doodler Jennifer Hom was the brains behind the elaborate doodle, which was a team effort. She and other illustrators spent about three months putting the whole thing together. They even studied a bunch of old Queen albums and videos to pick out visual cues. "My obsession with Freddie Mercury affected everyone else around me," she said. They decided to go with the song "Don't Stop Me Now" because it's one of Queen's top 10 hits of all time, plus Mercury actually wrote it. Mercury also wrote such classics as "Bohemian Rhapsody" and "We Are the Champions." He died of bronchopneumonia resulting from AIDS in 1991, just one day after announcing he had the disease. Queen guitarist Brian May remembered his former bandmate in a guest post on Google's blog. "Even though physically he is not here, his presence seems more potent than ever," May wrote. "Freddie made the last person at the back of the furthest stand in a stadium feel that he was connected. He gave people proof that a man could achieve his dreams—made them feel that through him they were overcoming their own shyness, and becoming the powerful figure of their ambitions. And he lived life to the full. He devoured life. He celebrated every minute." Hom tried to squeeze in as many humorous and respectful references into the doodle as she could. "Considering how colorful Freddie's career was, we wanted to create a doodle that was just as colorful," she said. Viewers may notice references to "Bicycle Race," "A Crazy Little Thing Called Love," "I Want to Break Free," "Flash" and more. The Mountain View-based search giant published the Mercury doodle worldwide on its homepage Monday, except for in the US, which will be celebrating Mercury's birthday on Tuesday out of respect for Labor Day. "We're all really excited because it is such a big doodle," Hom said. "It's definitely not our normal doodle." Google's two-minute video tribute to Charlie Chaplin is the only doodle with a longer run time than the Mercury doodle.